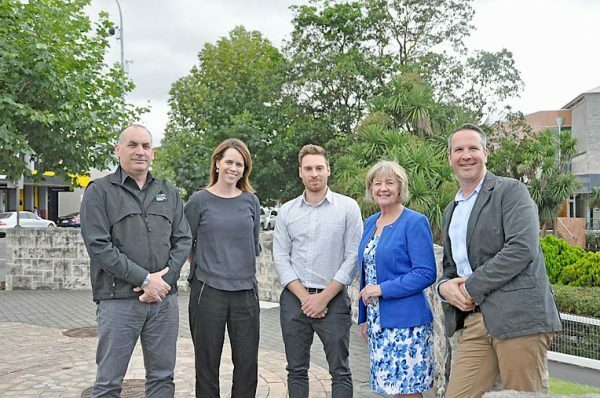 UNLOCKING GROWTH: Limestone Coast Local Government Association’s Dominic Testoni and Michaela Bell show Regional Australia Institute’s Ben Vonthethoff and David Spear the Cave Gardens in Mount Gambier. The association’s president Mayor Erika Vickery, second from right, also joined this week’s delegation. GROUND-BREAKING research is under way in the Limestone Coast to potentially unlock billions of dollars in growth opportunities. The Limestone Coast Local Government Association (LGA) has partnered with the Regional Australia Institute to pinpoint priorities that will turbocharge the region’s economy.